Kiara and Erhan recently celebrated their love and commitment to one another with a stunning wedding ceremony in the Great Hall and gardens of Monstalvat, Eltham. The pair appeared to be royalty among the landscapes and architecture of the venue. The luscious scenery and grand buildings helped make their wedding one to remember. All eyes were on Kiara. She was definitely a princess in her elegant lace-sleeved gown with gorgeous tulle skirt. Her simple and classy up-do complimented the dress perfectly and Kiara’s bouquet added a fun and youthful touch to her bridal look. With one of JC Jags’ specialty wedding cars, Kiara and Erhan’s wedding had its final touch of class and elegance. What’s more perfect for a classic wedding than an expertly driven, classic car? JC Jags professionally chauffeured, wedding cars are perfect for any occasion. Especially weddings. The team at JC Jags pride themselves on looking after you from the moment you enquire to the very end of your wedding day. These expertly maintained and driven cars can set your wedding apart from all the rest. Their classic aesthetic is no match and service is like no other. 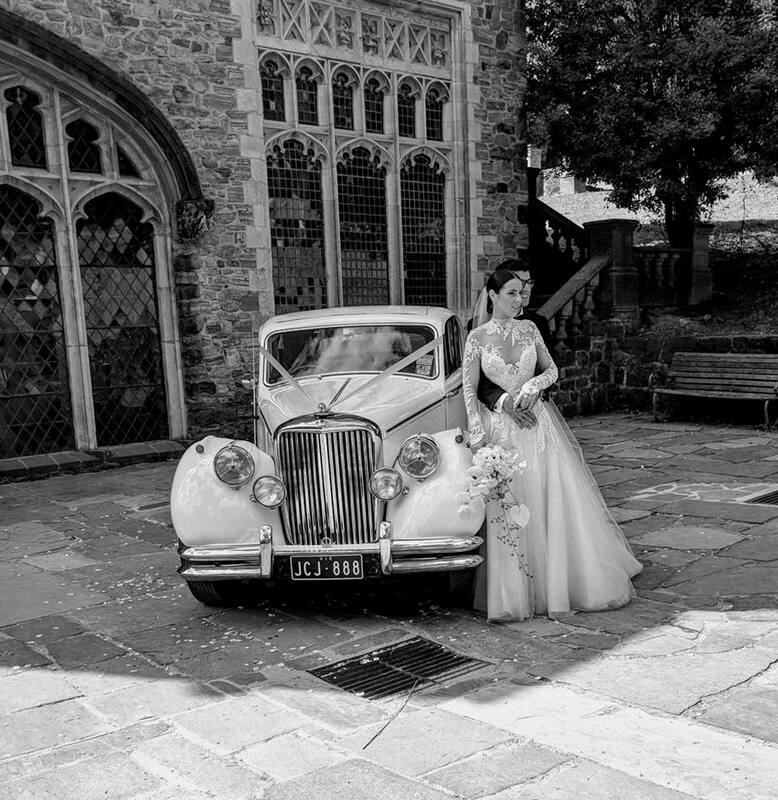 Whether you want to add a touch of vintage style to your wedding or are going all out with classic elegance, JC jags have a car to suit you. Like Kiara and Erhan you’ll look and feel like royalty on your wedding day or other occasions such as debutante balls, school formals, and more. JC Jags wishes Kiara and Erhan all the best and thank them for choosing JC Jags for their wedding day.